As February is coming to an end, I thought it would be a good moment to share my "Empties". Tubes, bottles and jars of beauty products I've used up recently, so I can give you my feedback with this series of mini-reviews. This month, I've cumulated an obscene quantity of empty bottles, so this time I'm going to talk only about the skincare and makeup products and I will address the body and hair products in a future post. Have you done anything special last weekend? It was terribly cold (and still is) here in Switzerland, but we had a sunny Sunday. We were lucky to spend the Sunday afternoon with friends and it was delightful! We don't gather as often as I'd like with our friends, but when we do it's always a memorable moment that I enjoy hugely. What about you? How often do you meet with friends? Now, let's get into makeup! 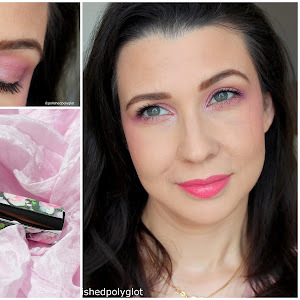 Today's makeup for the Monday Shadow Challenge combines "neon pink and copper". The result is BOLD & BRIGHT! What's your hobby? There's a lot of things that I enjoy doing for fun, but in the past few years I find nail art one of my favourite hobbies. It's a creative activity, that involves a little planning, some practice and special technique, and it also kind of therapeutic! It definitely helps me unwind and relax! For today's manicure, the girls of the "Nail Crazies Unite" challenge are doing "Hobbies" theme nail art using colours "red and black". My challenge today was creating a nail art that evokes nail art!! It was so much fun! Today I'm super excited because this afternoon we'll be hosting my son's birthday party. We invited 10 of his schoolmates and ALL of them confirmed their presence. It gives me satisfaction to know that my son is loved and appreciated at school :) We had a small celebration on the 21st -his actual birthday- but it was only us and my hubby's dad, we had dinner and I made a birthday chocolate cheesecake. Today, we'll host the children's party, with balloons, games, candy and cake and on Sunday we'll be inviting some friends and family to celebrate (again). It sounds crazy, but in Argentina, many people do multiple reunions to celebrate and I find it natural. Do you also do multiple celebrations for birthdays? Well, enough digressing, let's talk about nail art. 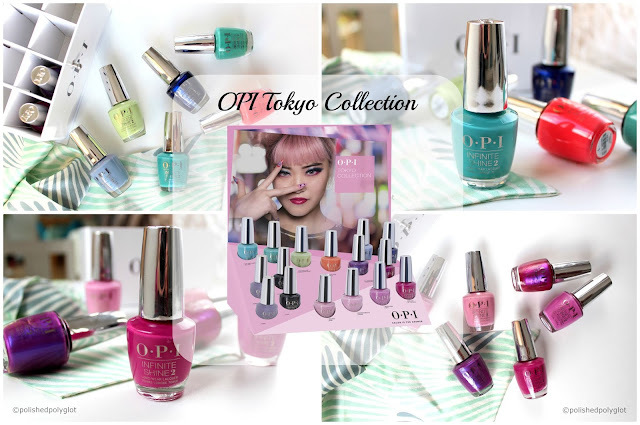 More precisely, today I'll present you a tool and method to remove soak-off gel nail polish, or semi-permanent nail polish, with minimum hassle and minimum waste. Is that possible? Well yes! Thanks to the awesome Silicon Soak Off Caps from BeautyBigBang Store*. Keep reading to find out more! Is there anyone from Pisces in your life? One person of Pisces totally changed my life, for good. One person that taught me many things about myself, that pushed me to do things I didn't know I was capable of. One person that showed me I was so much stronger than anyone imagined, even myself. He's the one who believes the most in me, he supports me and he is proud of me like nobody else, not even myself. So, if I was going to take this Zodiac thing seriously (which of course I'm not) I would say -based on my experience- that Pisces people are great! Of course, I'm talking about my first child, my son. Yesterday was a special day for me, my son turned 6!! And it was also my 6th anniversary as a mom. I can't believe 6 years have passed since I first held his chubby little face in my hands. I know, every mom has that feeling, at least once, that the time passes so cruelly fast and that our little ones grow up too soon. I'm not being original, I know. But I can't help it, looking at photos of my boy when he was a baby, now that he has become such a tall, sweet and smart little man. Well, you might wonder what does Pisces have to do with anything. 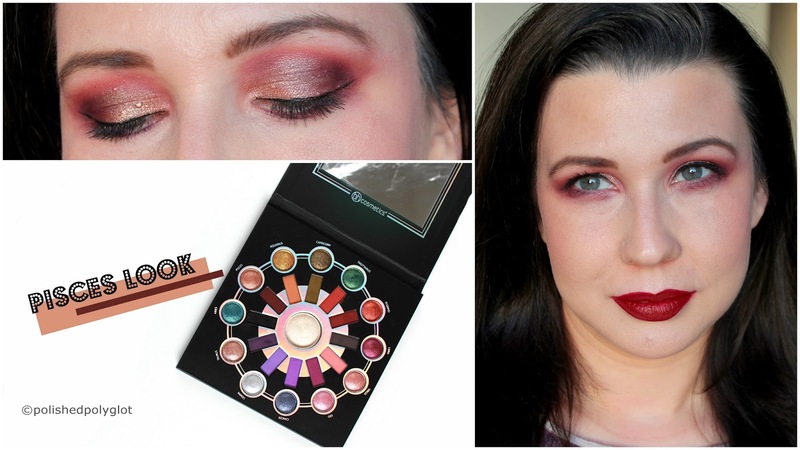 Well, if you've been following me lately, you know I'm trying to have more fun with the makeup I own (instead of buying new) and I challenged myself to create twelve different looks with the BHCosmetics Zodiac palette, one for each sign. Today is the turn to "Pisces" and here is my look, I hope you like it! Aujourd'hui je vais vous parler d'une nouvelle crème pour les contours des yeux de la luxueuse marque Suisse des soins La Colline. Cette nouvelle formulation appelée "Soin Cellulaire Redéfinition Contour des Yeux"* promets combattre le relâchement des paupières qui arrive avec l'âge. Cela arrive à tout le monde en plus grand ou plus petite mesure, que la délicate peau des paupières perd la tonicité et commence à se rélacher. Certes, cela n'arrive pas à 30 ans, mais si seulement il y avait quelque chose à faire dès 30 pour éviter cela? La Colline a la réponse. Presque trop beau pour être vrai, n'est-ce pas? Lissez la suite pour connaître mon expérience! Today I am going to talk to you about a new cream for the eye contours by the luxurious skincare Swiss brand La Colline. This new formulation called "Cellular Eye contour Definition" * promises to fight the sagging eyelids that appears with age. It happens to everyone in greater or smaller extent, that the delicate skin of the eyelids loses tone and begins to slack. Of course, it does not happen at 30, but if only there was something to do from 30 to avoid that? La Colline has the answer. Almost too good to be true, is it? Keep reading to know my experience! How was your weekend? It was Carnival celebration in my city (Biel) this weekend and we wanted to go watch the Children's Parade on Saturday. But it poured the whole afternoon and it was so freaking cold, that we decided to stay in. I was a bit of disappointed to miss the Carnival, I hoped to have fun with the children, but in the end, I thought it was wiser to stay in. We've been ill for nearly two months in a row, with different viruses and stuff, and now that the children are finally fit again, I didn't want to risk their health by standing two hours under the freezing rain. Instead, we spent the afternoon building a Harry Potter LEGO that was way too difficult for my children's age, so they needed extra help ;) . My boy is starting to get hooked on Harry Potter's stories, although they are quite a complex reading for his age (he'll turn 6 on Wednesday) he seems to enjoy it a lot, especially the suspense parts! Well, I got carried away with my family stories, let's get into makeup! 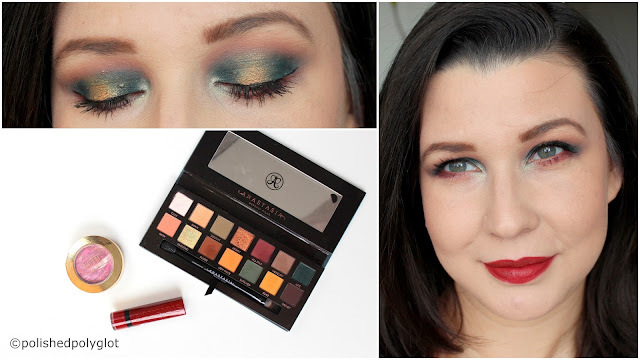 Today, as every Monday, I have a new makeup look to show you for the Monday Shadow Challenge! 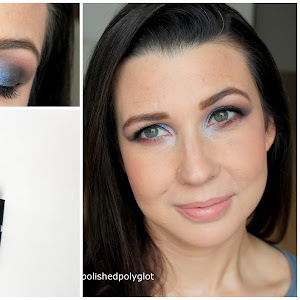 This week, I've created an edgy makeup in "petrol blue and brass", a combo I would have never thought to put together! I hope you like it :) . Valentine's day has passed but love is still in the air, so today I have a new Love themed nail art design and a new nail art review to share with you. The 26 Great Nail Art Ideas challenge prompted us to create a "love" nail art but not using pink or red. For creating it, I used is a beautiful multichrome loose pigment from BeautyBigBang store*. I show you how this powder changes magically your manicure. I really hope you like it!! Hello, sweeties! I hope you all spent a lovely Valentine's day yesterday! I took the day off from blogging and social media yesterday, I spent the whole day with my 5 year-old son and we did some fun stuff together. We also went to the cinema, as my boy really enjoys it. We didn't do any Valentine's related celebrations (except heartshaped raspberry and chocolate mousse that we had for desert, lol). Did you celebrate this Date? I'm very excited to show you my new brushes from the Real Techniques Insta-pop Collection! I've been testing these for a while and if you were thinking to get one of these brushes, I think you'd better read about my experience first because it could be somewhat useful. I'll be talking about the Insta-Pop Face brush and the Insta-Pop cheek brush after the jump! Children have a one week break from school this week, so this morning we are taking it easy, having breakfast without stress in our PJs. It feels like an extension of Sunday! I'd love every Monday to be like this! We are planning some really fun things with the children this week, but not many outdoors activities as the weather announces very very cold and both my children are still coughing. Even the hubby took one day off this week and he'll spend it with our boy doing "boy's stuff". Do you children also have a mid-term break too? 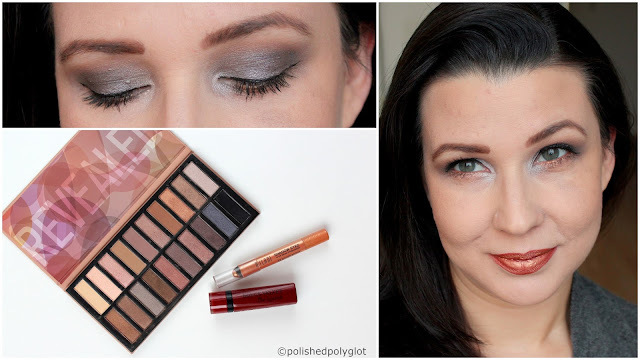 Today, as every Monday, I have a new makeup look to show you for the Monday Shadow Challenge! This week, I've created a metallic makeup in "gunmetal and bronze", it was quite challenging combining these two shades, I hope you like the look. We just had a family brunch and I made a massive amount of pancakes because everyone loves them :P It was smowing outside and it was so pleasant to enjoy a meal without stress and filled with laughs. The rest of the day we'll have a (well deserved) rest and I will blog a little. What about you? What do you enjoy doing in winter Sundays? Today I'd like to talk you about one of my favourite products, this is a makeup setting Spray from the brand Skindinavia. Keep reading to find out why I like it so much! It's time for a new manicure! Today the girls of the "Nail Crazies Unite" challenge are doing "Anti-Valentines Hearts". How fitting is that for this period of the year? I hope you like it! Metal nail files are out. Yes Mam', if you are still using a metal nail file you should know you could be damaging your nails! In fact, it takes a pro-technique to actually file your nails correctly with a metal file, which most of us totally ignore. The safest option today is a glass nail file. The best nail salons and nail pros only use glass nail files, and they are also a great option for your personal use at home! Swarovski has recently launched a new amazing Valentine's day Collection, as every year. But there is also a collection called #SwarovskiRemix with a new concept that I find absolutely brilliant! You know I have a soft spot for Rose gold jewellery, and my hubby got me a wonderful bracelet from this collection while we were in Brighton, for our 20th anniversary. I'll tell you more about the Remix collection if you keep reading! How was your weekend? We freaked out a bit on Friday because our youngest one woke up and she had scratched herself everywhere hurting herself (even though her fingernails were very, very short). We know her eczema can be itchy, but this was unprecedented! I remembered there was a warning of chickenpox at the daycare, but as both my children are vaccinated, I didn't pay much attention. Suddenly, I thought she might have caught the chickenpox despite of the vaccine, which is totally possible, as it is not 100% effective as other vaccines. On top of it, my boy told me he had a couple of spots himself, which to me looked exactly like chickenpox spots. So I was mentally preparing for a hell of a weekend. INSTEAD, on Saturday everyone woke up super fit and felling better, without spots or itchiness! It was soooo weird!? What was it? Could it be that they caught the illness but as they're vaccinated that was a soft form of chickenpox? or maybe it wasn't that at all? Have you experienced something like this? Anyways, in the end it was a sunny, relieved, beautiful weekend! 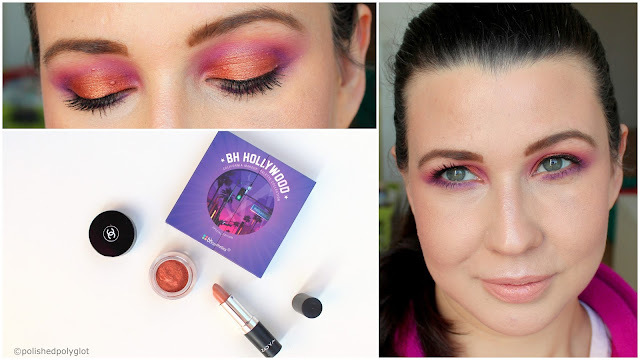 As every week, today is time for another Monday Shadow Challenge! 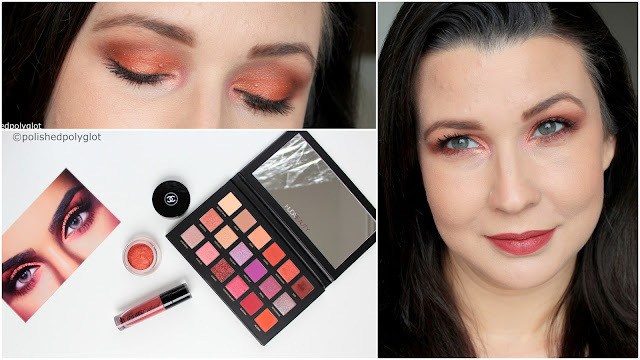 This week, I've created a monochrome makeup in "rust and tangerine", I hope you like the look. Hello, my lovelies! How is your weekend so far? Today I have a new nail art design and a new nail art review to share with you. I prepared a Neon and Black manicure for the 26 Great Nail Art Ideas challenge, and for creating it I used is a Peel off cuticle guard from BeautyBigBang store*. I show you how to create fun manis without the mess thanks to this useful product. I really hope you like it!! How was your week? Which are your plans for the weekend? I have had such a nice and productive week. All the family has fully recovered from all the nasty viruses we had in January, and everyone is fit again. I have started to workout every morning for just 30 minutes before starting with my daily activities and it makes me feel great. I'm starting slowly because it's been ages since I last worked out and I have a few old injuries to pay attention to. So for a couple of weeks, I'm focusing on activating my muscles again. I plan on increasing the workout level making it more challenging as the weeks pass, but I'm taking it easy for now, to avoid hurting myself. Today I'd like to share with you a new makeup look I created using my BHCosmetics Zodiac palette. 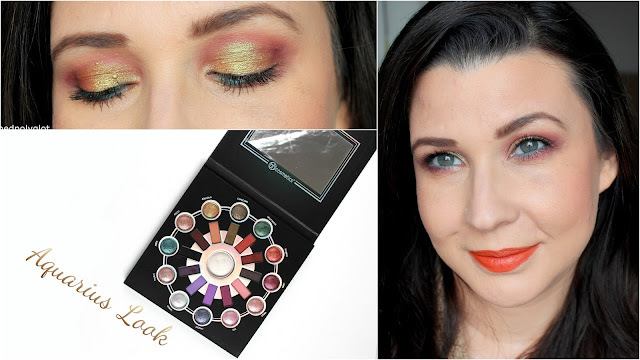 I REALLY wanted to challenge myself to create twelve makeup looks with this baby, one for each Zodiac sign, and today's makeup has been done using the "Aquarius" colours from the palette. This year too I'm continuing with my Challenge of using my makeup more and stop collecting it. Yes, I have changed my perspective towards makeup from "collecting it" to "using it". I have enjoyed a lot creating my collection, buying pieces that I carefully chose and I'm happy with the nice stash I've amassed. But now, I enjoy a lot more USING it! Yes, I've discovered that I enjoy much more using the makeup than just possessing it, therefore, I started this personal challenge called "Shopping my stash".